FCPS Part 1 exam is based on complicated course, by using the word of “complicated” i mean any question can come from anywhere because Medical field is so much wast that it can not be covered completely. It is like “to build a bridge over the sea”. 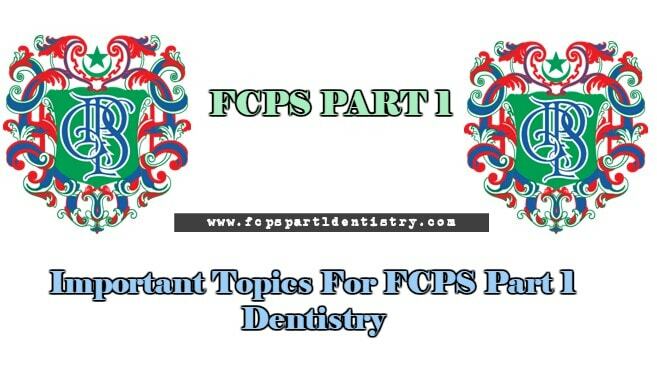 But all this discussion is not to make people scared about exam of FCPS-1, by covering the basics and important topics it will be easier for candidates to go for exam with confidence. Anatomy is further divided into 1) Gross Anatomy, 2) General Histology 3) Oral Histology and 4) Developmental Biology. CRANIUM, CRANIAL FOSSAE, FACE AND VISCEROCRANIUM, SCALP, MENINGES, PTERYGOID PLEXUS OF VEINS, VENTRICULAR SYSTEM, BLOOD-BRAIN BARRIER, INTRACRANIAL CIRCULATION, ORAL CAVITY, TONGUE,PALATE, PHARYNX, LACRIMAL GLAND, MASTICATION, TEMPOROMANDIBULAR JOINT (TMJ), CERVICAL VERTEBRAE, LAYERS AND FASCIA OF THE NECK, TRIANGLES OF THE NECK, SCM, TRAPEZIUS MUSCLES, HYOID BONE, SUPRA AND INFRAHYOID MUSCLES, CERVICAL PLEXUS (OF NERVES), CERVICAL PLEXUS, PHRENIC NERVE, BLOOD SUPPLY TO FACE, EXTERNAL CAROTID ARTERY, VENOUS DRAINAGE FROM THE FACE, LYMPH NODES IN THE FACE, THYROID, PARATHYROID GLANDS, LARYNX, RESPIRATORY SYSTEM, AXILLA, BRACHIAL PLEXUS, LIMB MUSCLES AND FUNCTIONS BY JOINT, STERNUM, CLAVICLE, RIBS, INTERCOSTAL SPACE, MUSCLES OF RESPIRATION, ABDOMINAL REGIONS, RECTUS SHEATH, BREAST, DERMATOMES, REFLEXES. BODY CAVITIES, LUNGS, HEART AND GREAT VESSELS, ATRIA, VENTRICLES, VEINS OF THE HEART, MEDIASTINUM, THYMUS, AORTA, AZYGOUS SYSTEM, SPLANCHNIC NERVES, SUPERIOR VENA CAVA, INFERIOR VENA CAVA, PORTAL VEIN, PORTAL TRIAD, LYMPHATIC SYSTEM, GASTROINTESTINAL TRACT, STOMACH, LIVER, SPLEEN, PANCREAS, ADRENAL GLAND, URINARY SYSTEM, KIDNEY. NERVOUS SYSTEM, BRAIN, CRANIAL NERVES, SPINAL CORD, PERIPHERAL NERVOUS SYSTEM. Cell, PLASMA (CELL) MEMBRANE, CYTOPLASM, MEMBRANE-BOUND ORGANELLES, NON MEMBRANE-BOUND ORGANELLES, NUCLEUS, CELL SURFACE APPENDAGES, THE CELL CYCLE, CELL-TO-CELL CONTACTS, EPITHELIUM, FUNCTIONS OF EPITHELIUM, CLASSIFICATION OF EPITHELIUM, BASEMENT MEMBRANE, FUNCTIONS OF BASEMENT MEMBRANE, COMPONENTS OF BASEMENT MEMBRANE, CONNECTIVE TISSUE, CLASSIFICATION OF CONNECTIVE TISSUE, CONNECTIVE TISSUE PROPER, CONNECTIVE TISSUE ATTACHMENTS, CELLS OF CONNECTIVE TISSUE, GLANDULAR TISSUE, TYPES OF GLANDS, CLASSIFICATION OF EXOCRINE GLANDS, STRUCTURE OF SALIVARY GLANDS, CARTILAGE, CARTILAGE MATRIX, SURFACE OF CARTILAGE, GROWTH OF CARTILAGE, BONE, FUNCTIONS OF BONE, BONE MATRIX, BONE FORMATION, BONE GROWTH, TYPES OF BONE, BONE SURFACES, BONE MARROW, BONE REMODELING, FRACTURE REPAIR, CALCIUM REGULATION, JOINTS, CLASSIFICATION OF JOINTS, TYPES OF SYNOVIAL JOINTS, SYNOVIAL JOINT COMPONENTS,NERVOUS TISSUE, NEURONS, NEURON CLASSIFICATION, SYNAPSES, SUPPORTING CELLS, MYELINATION, BLOOD, FUNCTIONS,COMPONENTS, ERYTHROCYTES, LEUKOCYTES, HEMATOPOIESIS, CARDIO VASCULAR TISSUE, ARRANGEMENT OF BLOOD VESSELS IN CIRCULATION, LAYERS OF BLOOD VESSEL WALLS, LAYERS OF THE HEART, CARDIAC CONDUCTION, LYMPHATIC SYSTEM, LYMPH, FUNCTIONS OF THE LYMPHATIC SYSTEM, LYMPH DRAINAGE, ENDOCRINE Glands, PITUITARY GLAND (HYPOPHYSIS), THYROID GLAND, PARATHYROID GLANDS, PINEAL GLAND, ADRENAL (SUPRARENAL) GLANDS, RESPIRATORY SYSTEM, DIVISIONS, ALVEOLI, UPPER DIGESTIVE SYSTEM, ESOPHAGUS, STOMACH, SMALL INTESTINE, LARGE INTESTINE, GUT-ASSOCIATED LYMPHATIC TISSUE, LOWER DIGESTIVE SYSTEM, LIVER, PORTAL TRIAD, LIVER LOBULES, HEPATOCYTES, HEPATIC SINUSOIDS, BILIARY TREE, BILE COMPOSITION, GALL BLADDER, PANCREAS, EXOCRINE PANCREAS, ENDOCRINE PANCREAS, URINARY SYSTEM, COMPONENTS, COMPONENTS OF KIDNEYS, NEPHRON, INTEGUMENT, FUNCTIONS OF SKIN, LAYERS OF SKIN, HAIR, SEBACEOUS GLANDS. ORAL SOFT TISSUE, ORAL MUCOSA, GINGIVA, DENTOGINGIVAL JUNCTION, TOOTH AND SUPPORTING TISSUES, DENTIN, ENAMEL, PULP, CEMENTUM, ALVEOLAR BONE, PERIODONTAL LIGAMENT. TOOTH DEVELOPMENT, EMBRYOLOGY OF THE FACE AND PHARYNGEAL ARCHES, BRANCHIAL ARCHES, PHARYNGEAL POUCHES, FORMATION OF THE FACE, MOUTH AND ORAL CAVITY. GAMETOGENESIS, EMBRYOLOGY OF THE CENTRAL NERVOUS SYSTEM. Following are the topics to be covered for pharma. Properties used to Characterize Materials** Gypsum Products for Dental Casts** Waxes Investments and Refractory Dies* Metals and Alloys* Gold and Alloys of Noble Metals* Base Metal Casting Alloys Casting* Steel and Wrought Alloys* Ceramics and Porcelain Fused to Metal (PFM)* Synthetic Polymers* Denture Base Polymers* Denture Lining Materials Impression Materials, Classification and Requirements** Non-elastic Impression Materials* Elastic Impression Materials: Hydrocolloids* Elastic Impression Materials: Synthetic Elastomers Direct Filling Materials* Dental Amalgam** Resin-based Filling Materials* Adhesive Restorative Materials: Bonding of Resin-based Materials* Glass Ionomer Restorative Materials* Resin-modified Glass lonomers and Related Materials Temporary Crown and Bridge Resins Requirements of Dental Cements for Lining, Base and Luting Applications Cements Based on Phosphoric Acid* Cements Based on Organometallic Chelate Compounds* Polycarboxylates, Glass Ionomers and Resin-modified Glass Ionomers for Luting and Lining*. Next articleWhat Next after BDS? FCPS or ……. ?